SOHO Rochester Hills offers an extensive sushi menu so I decided to add it in as a destination on my sushi tour. We did not dine in at SOHO Rochester Hills so I can’t comment on the wait staff service. Take out service was very quick and accurate. They were nice enough to accommodate us by splitting our order into three cartons so that each of us had our rolls in our own takeout container rather than trying to figure out who’s roll was what. The Japanese menu at SOHO brings a large selection of sushi. 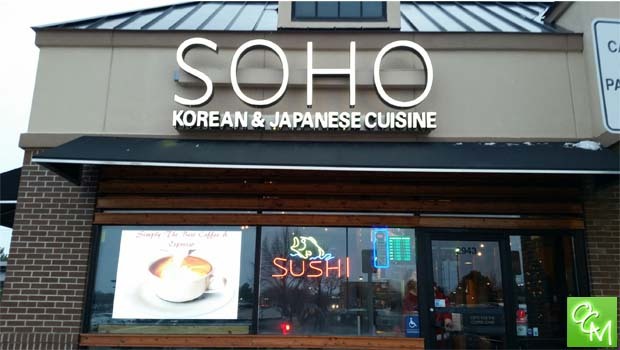 SOHO Rochester Hills offers the standard vegetable rolls, specialty rolls, tempura rolls, etc. We only ordered sushi and we were all happy with our selections. Everything was fresh and quality, nicely rolled, and well presented. My daughter was especially thrilled with her deep fried California Roll that was topped with Yum Yum sauce. She said this is now her favorite sushi roll! SOHO Rochester Hills menu also offers sushi entrees that are served with steamed rice, miso soup and a fresh salad. These seem quite authentic, e.g. Sushi Donburi – which is assorted sliced roa fish over rice and mixed greens with Korean chili sauce on the side. SOHO’s Japanese menu also offers traditional Japanese fare such as tempura dishes, teriyaki plates, and noodles entrees such as spicy ramen and spicy udon. SOHO also offers Korean cuisine on its menu. The Korean entrees are served with steamed rice and miso soup, and include items such as Kalbi (boneless short rib marinated in Korean barbecue sauce), Maewoon Dak Kui (boneless chicken thigh marinated in Korean hot and spicy sauce), Eel Kui (broiled eel with sauce), and more. SOHO also has many of the traditional Korean rice specialty favorites like Bibimbab… prepared many different ways. These dishes are served with miso soup and Korean chili paste on the side. You’ll also find Mandoo entrees, vegetarian plates, Korean soups, many different appetizers (softshell crab tempura, gyoza, octopus salad…), and side dishes (chicken wings, breaded mushrooms, chunky fries, onion rings, calamari fries, etc.) on the menu. SOHO Rochester Hills has an infused sake bar for those dining in. There are several different infusions to choose from. See related posts for more Oakland County Sushi Restaurants reviews. For more info on SOHO Rochester Hills menu, call 248-239-1179.